The company showed the new Volkswagen photos, and told some details about the expected model Passat Alltrack, which can be seen at the Geneva Motor Show in March this year. The model should be the main competitor to Subaru Outback and the Allroad Audi A6 Quattro. It has higher ground clearance, new bumper and the protective elements of the body. 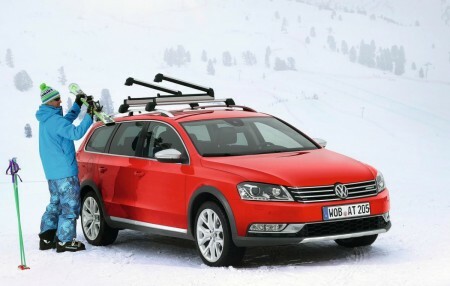 Passat Alltrack will be available in two versions - with front-wheel drive and 4x4. In the original version, we see a 17-inch wheels Valley, which for an additional fee may be replaced by 18-inch Canyo. Inside, new Passat equipped with special seats with logo Alltrack, which are covered with fine leather. In the European market VW Passat Alltrack will be available in versions with a 2.0-liter diesel engine (140 and 170 hp), 1.6-liter turbocharged gasoline engine (160 hp) and 2.0-liter petrol turbo engine (210 hp). The most powerful version will have four-wheel drive (4MOTION) and 6-speed robotized gearbox DSG. The cost of the car is about 37,000 euros.